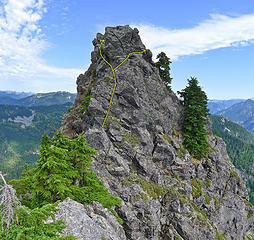 "Climb either NE or SE to the N or S ridge on brushy rock. 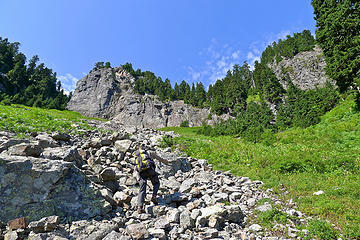 Follow the selected ridge to the summit"
Getting to North Bessemer constitutes most of the challenge in climbing this prominent Middle Fork peak. 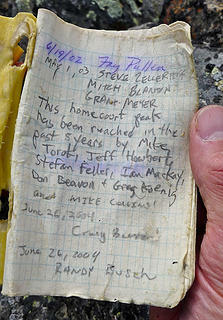 The guide book approaches recommend coming in the North Fork via Hancock Lake (now on gated roads), or up Quartz Creek road to Blethen Lakes (now overgrown). 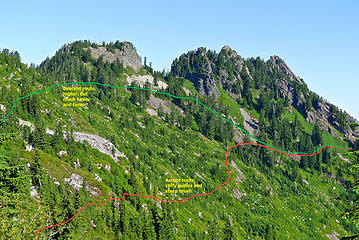 Most recent ascents are via the SE ridge or traversing from South Bessemer after a 5-mile walk up the Bessemer road. 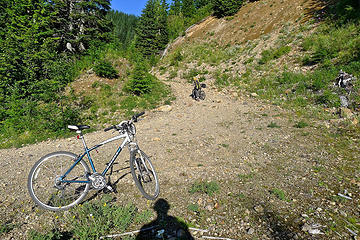 Martin and I chose the latter route, and brought mountain bikes along to speed up the descent, in theory at least. We got started early at 7:30am which was good, because pushing/riding the bikes up 5 miles and 3000' of road was hot work. We briefly rode past the turn-off that heads up to the pass, but corrected our error within minutes. Near the ridge we caught the road heading north to South Bessemer, and turned right again onto a spur at 4480' that traverses below South Bessemer and towards North Bessemer. 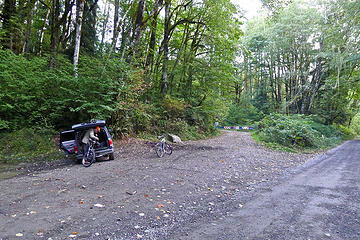 Martin brought his full suspension bike nearly to the end of this spur, but I left mine at the 3800' switchback because the road was getting too steep and rough for me to ride my generic bike down safely. 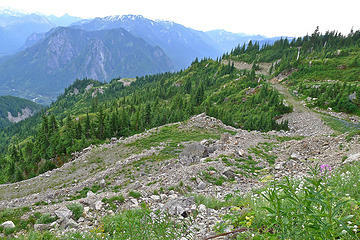 Turnoff to the logging road that heads toward the pass and Bessemer mountain. 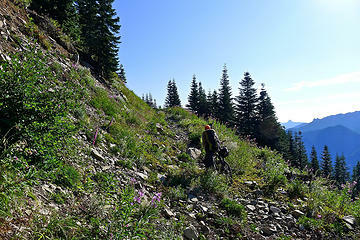 Do not be tempted by the more maintained level road that keeps going without elevation gain here. 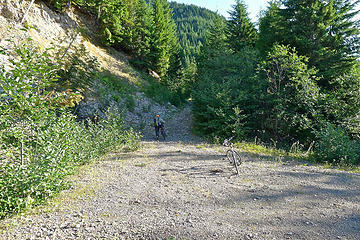 I left my bike here at 3800' because I didn't think I could ride down a gravel road this steep, and sections of it had large rocks. The Bessemer South road is not being maintained and sections like this would be difficult to bike down, but Martin is still taking his bike uphill. 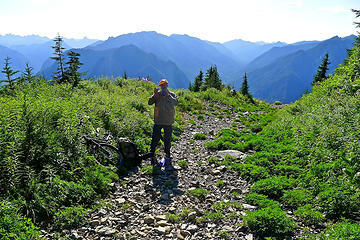 It took 3 hours to get to the end of the spur road at 4600'. 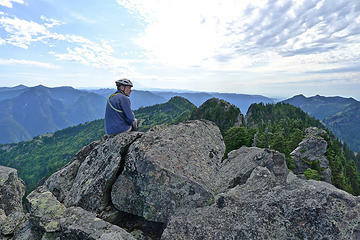 We could see the North Bessemer summit a scant .75 miles away and the traverse across the clear cut slopes to the rib crossing looked reasonable. But it was not to be. 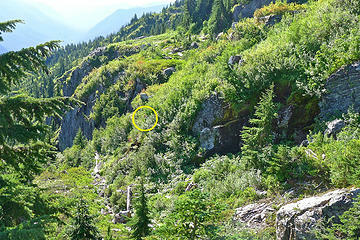 There are a number of cliffy gullies running down that slope hidden in the huckleberries and stumps. It took almost an hour to cross the next half mile, with many ups and downs and side hill steps hanging onto to bushes to keep from slipping. On the way back we stayed higher and cut that time in half. Now only .25 miles from the peak, it's necessary to cross a precipitous section of the SE ridge and descend into a small basin below the summit ridge. 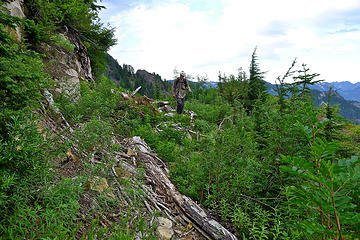 First there's a steep fern-covered talus field where it's challenging to find secure footing, then the descent on the far side of the rib is a slippery sequence of lowering oneself down using huckleberries to avoid a fall. 4 1/2 hours after starting out, it feels like the climb can finally begin. We gained a couple hundred feet up a talus finger, then were pleased to find a remaining bank of snow nestled by the cliff that we used to replenish our water supply. This was important because even though we'd brought a lot of water, we were going through a lot with the long bike push and traverse on a hot day. 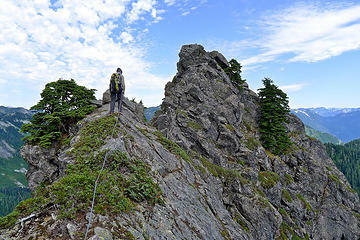 We scrambled up the gully and took a short break before tackling the ridge and 4th class summit block. 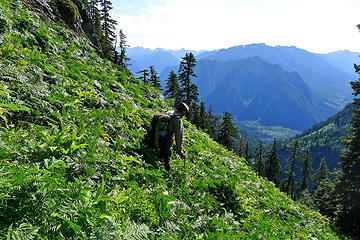 Just before reaching the rib there is a talus slope that has a thick cover crop of ferns and false hellibore, making it impossible to see what you're stepping on. 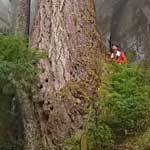 The first 20 feet from the notch looked steep so we tied in 30' apart and moved together under the theory that if one of us slipped the rope wrapping around trees would minimize the danger. 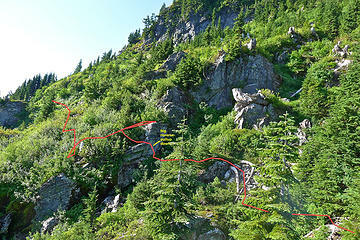 But after that first steep section, there's really no need for a rope until you reach the summit block. The one exception might be a short airy section where the ridge narrows down to a foot or so across. Martin led the final 40' section with a belay to the top, checking out both sides before deciding the left route around the overhanging block was easier. 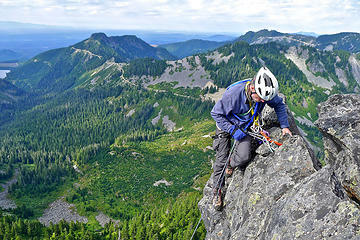 Martin walks across an airy traverse just before the Bessemer summit block. 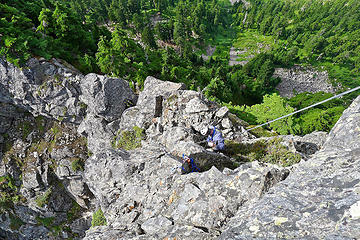 We were using a short rope between us, but were not belaying. Bessemer summit block. It's possible to go either right or left to avoid the overhanging top block. Both have exposure, but left is easier. There was lots of room on top and the views were great. 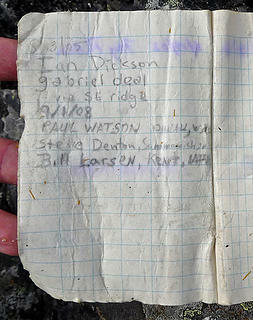 The summit register was so soggy we didn't even try to sign it. I wonder how many other parties have found the same thing, because there are not very many entries in the book -- just three pages since it was placed in 2002 by Fay Pullen. 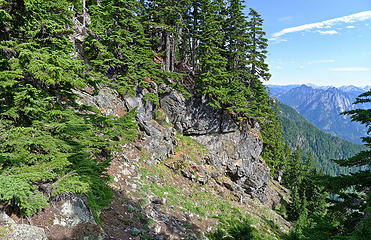 Bessmer ridge. One more 5040+ high point is hidden behind 5120+. We didn't wait long because it was a long ways out. 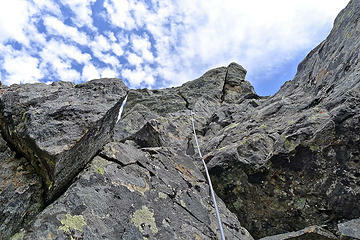 The rap off the overhanging summit block was interesting, and we rapped again to avoid the steepest down climbing in the summit ridge gully. 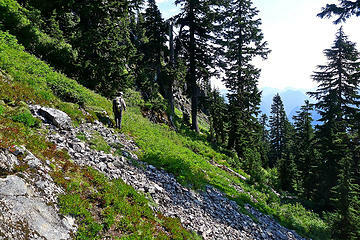 Then down the talus finger, over the rib, and an easier and faster traverse back to the road by staying close to the ridge line to avoid the gullies. Now the fun begins and we head for our bikes . But Noooooo! Martin's front tire had somehow gotten a flat while it was laying by the side of the road . On top of that, neither of us had brought a patch kit or a pump. This was not going to be the quick thrill ride down to the car we expected. 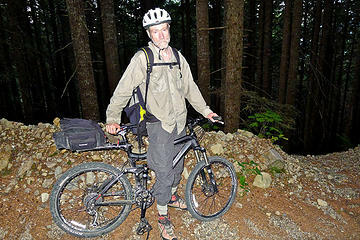 Martin made the best of it by shifting most of his weight onto the rear tire, and riding down slowly on the flat tire. But it was still 3-4 times faster than walking. We got back to the car at 6:30, 11 hours after starting out. Martin bemoans his flat front tire, robbing him of a hard-earned thrill ride down the Bessemer road. Don't underestimate this trip because of the access via a road and the short linear distance to the peak from the end of it. The traverse may go easier with spring snow covering the brush, but makes other parts more difficult. I highly recommend a fall trip, but bring enough water -- we were lucky to find a snow bank still there at the end of September. Most years that will not be true. Great pics and beta. 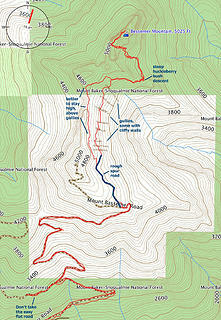 Quite involved for less than a mile of actual foot travel, but an interesting route. 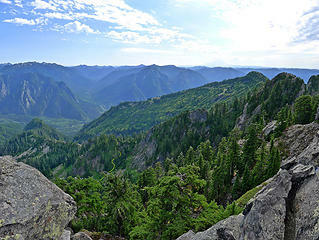 More fine Middle Fork fun. 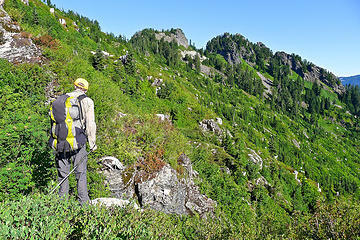 Are you working on a Middle Fork guidebook or just enamored with the area? 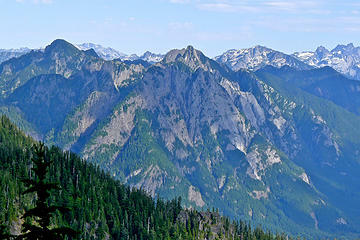 I have had some thoughts about creating a website for the Middle Fork, and I miss midforc.org. If I do decide to do that, I'll want to launch it with a lot of content so in that sense yes, I'm "working" on it but I'd write up these trip reports anyway. The real answer is that I'm obsessed by the Middle Fork because it's close and wild and has a huge variety of things to do. Much of that is off trail, which is what I really enjoy. I don't like driving too far to get my hiking/exploring jones satisfied. Great idea about the website . 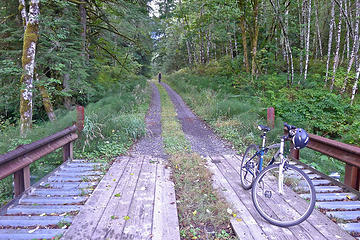 I am starting to catch the Middle Fork bug for the same reasons as you. I like the way you add the route lines to some of the photos. It really helps to tie in the photos to the write-up. 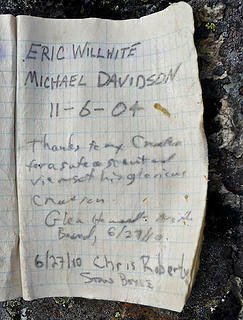 Thanks for another nice Middle Fork report. 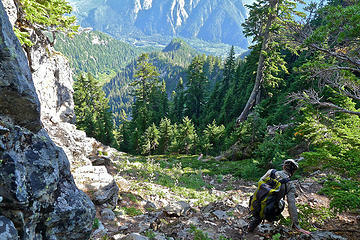 Excellent TR on a peak I have always wondered about! Good pics and details. Nice work! 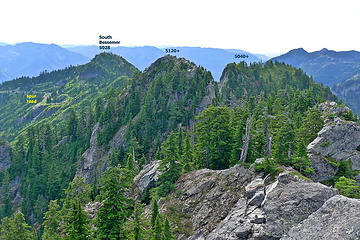 It is crazy how difficult some of these 5k peaks on the Middle Fork are. 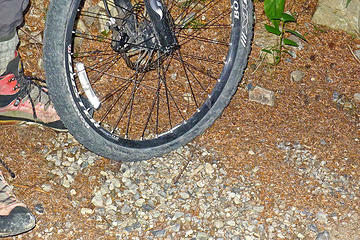 Next time try disengaging one side of the tire bead and packing the tire with leaves and duff. Stuff it full then reseat the tire bead. A buddy of mine claims this "works" or at least won't do as much damage to the rim as the weight transfer technique.